The picture really says it all. 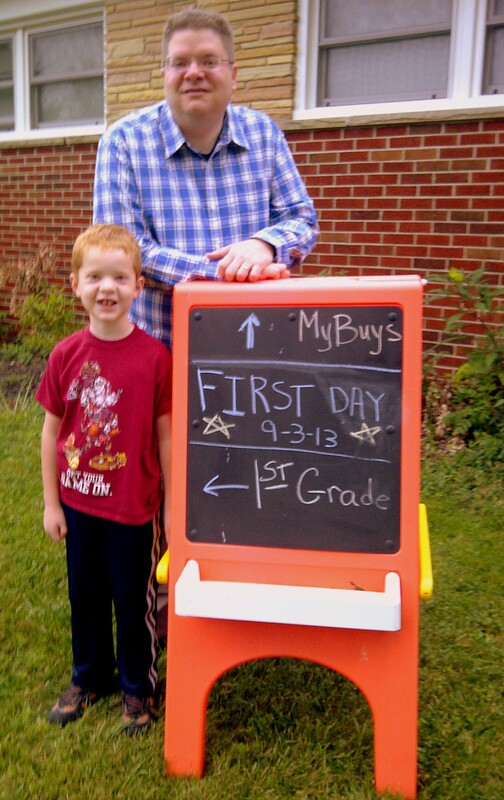 Hubby started a new job on Tuesday, the same day that my 6-year-old started first grade. Two days later, my 3-year-old and I have just returned from an interview with her new preschool teacher. My work area is stacked high with school calendars, PTA reminders, and student handbooks. I haven’t read through any of those things yet because I’ve spent the last two days filling out emergency cards, photo releases, medical forms and parent surveys. Please do not think I am complaining for one second. (Well, maybe just one.) I am thankful that my husband has found a promising new job. Our family are now seasoned pros at the kids’ elementary and pre-schools; we anticipate that it will be a good year. I am grateful. I’m quite sure I am. I think. I can’t really say with certainty how I feel about anything. Many of my mommy friends are posting tearful “I can’t believe my baby is growing up” captions to accompany their kids’ back-to-school pics. I am a person who craves routine and these last few months – which included a long break from school for my son and an emotional employment roller coaster for my husband – have been anything but predictable. I keep saying I’m glad to be back on a schedule, but I’m not really there yet. I haven’t had one moment to process how I feel about anything that’s happened this week. Once the forms are filled out, the policy manuals are read, and hubby figures out his commute, maybe I will have time to deal with my own emotions. It may be October before I cry about my baby starting preschool; it may take a few weeks before I get philosophical with “Where does the time go?”-type questions. Right now, I consider every packed lunch to be a success; every appointment kept, a victory; and leaving the house with my hair and make up done, a triumph. What about you, household manager/domestic engineer/super-mom/super-dad? How do you cope with the first week of school? Makes me tired, just thinking about all of those details. Every stage of life has its rewards, and I’m OK with being where I am right now. As I was a single mother of three, back to school meant relief to me. I did not have the stress of finding affordable babysitters or day care for three making just above minimal wage. But it also meant that I had to worry about missing work to take care of sick children as we all know that they take turns with viruses. But it also meant that my routine was back, like you said, of packing lunches, filling out forms, coming up with money to pay those exuberant prices of photos that stay in the envelopes, and countless immunization appts. As I reflect back on those days, I think I would do them all over again and not sweat the small stuff as much. I miss my babies and watching them become big people.